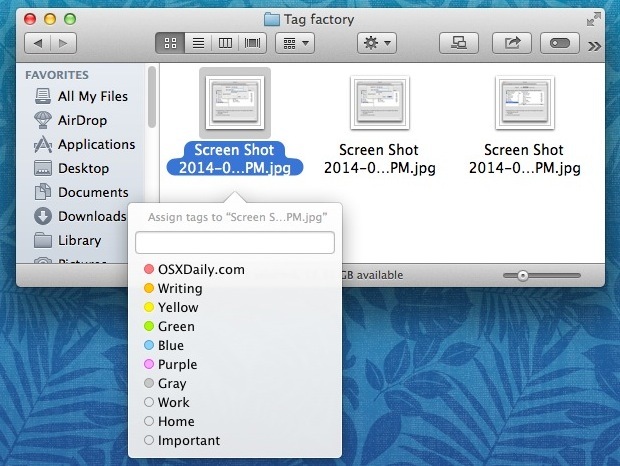 Have you ever wished you could tag files on the Mac with a simple keystroke? You’re almost certainly not alone. Tagging files and folders in Mac OS X can be a handy way to help manage and organize the contents of the Finder, even if only used on a limited basis for specific projects. To get the most out of file tags though, you’ll want to get quick access to the feature. One way to do that is with the drag and drop tagging method, but an even quicker way for Mac users who are primarily keyboard focused is to use a keyboard shortcut for the purpose. Mac OS X doesn’t come with a file tagging keystroke by default, but with a few steps you can create your own keyboard shortcut which brings about the tag option anywhere in the Finder. This article will show you how to create a custom keyboard shortcut for tagging files in Mac OS, the resulting keystroke approach offers perhaps one of the fastest ways to tag files and folders on the Mac. Now that you have the tagging keyboard shortcut setup, you’ll want to try this out yourself so you can see how fast it is. Go back to the MacOS X Finder and select any file or folder you want to tag, then hit your newly defined keyboard shortcut for tagging (it will be Option+Command+T if you followed our example, but use whatever you set). You’ll see a popover show up that lets you to select an existing tag or create a new one. This popover tag panel is keyboard responsive and uses prediction as well, so you can complete the entire process without your hands ever leaving the keyboard. Enter the first few characters of the tag to use to autofill the rest, then hit return to complete the tagging process. When finished applying the tags, hit the “Escape” key to exit out of the file tagging popover menu. Done with a project, or just want to strip a tag from a file or folder? Don’t forget that removing tags is simple too, and it can even be done through the same keyboard shortcut trick outlined above. Simply select the file, hit the same keystroke to summon the tagging menu, and then hit the delete key followed by Return to complete the tag removal. Have any other cool keystrokes for tagging or related tasks? 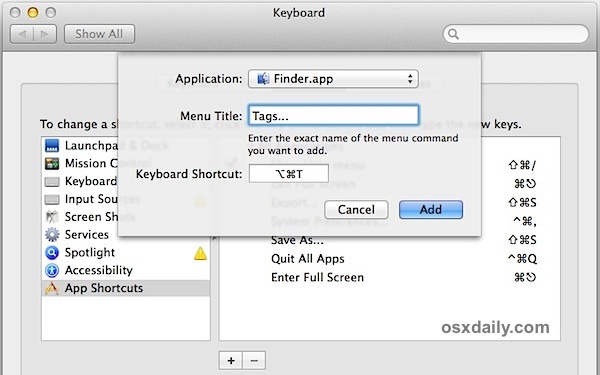 Do you like the custom keyboard approach or prefer another way to tag files on Mac? Share your experiences and thoughts in the comments below. Nicely done — thanks for the really useful tips & tricks. Funny nobody said this before, but this didn’t work for me until I left a space between “Tags” and the three periods. need to type a spacebar in between! Do you how it will work in Sierra? In Sierra (at least the German version) you have to insert a non-breaking space (option+space) between Tags and the ellipsis. Just spent an hour figuring this out. Thank you Apple. Word, looking to do the same exact thing. I want to tag my stuff green quick! just do the shortcut, then type the first letter of your tag and hit enter. thats pretty quick..
On El Capitan use “Tags …” with a space between the word “tags” and the 3 points “…”. I’m running El Capitan 10.11.3 (15D21) (French version) and “Tags…” is working well. Hi the shortcut isn’t working anymore since the latest Sierra Update. Has anyone a clue how to fix this? Maybe try to open Finder and see how is written the command on Files. 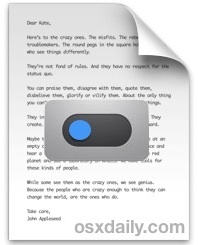 This exact text “Tags…” or “Tags…” or whatever should then be used as the Menu Title during the shortcut edition. Thanks a lot for this usefull trick ! This did not work for me at all. I tried it with and without the space. I also change it to com+opt+/. I’m on the very latest operating system. What am I doing wrong? Oops… I didn’t mean to put the URL in my question. Please disregard. It worked! This is really helpful. Thank you! An alternate way to add tags to a selected item (which I prefer) is to choose Get Info (or Command-I) to bring up the GetInfo window and then enter your preferred tag[s] in the appropriate space. Any way to go one step further and create a shortcut for a specific tag? I tried “Add Tag “Blue” because that is what appears when I hover over the blue dot in the Finder Tag menu, but it didn’t work. I am not having success with this shortcut..despite the space after the word “Tags”. There is no checked box next to the menu after I’ve added the shortcut..does that matter? I’ve tried it under all applications and under Finder app. Also right now ‘option+command+t” is assigned to hiding and showing the sidebar. how can I reassign it? I’ve been using a keyboard shortcut for the Finder menu “Tags…” as described in this post for a long time. Suddenly with Mojave it has stopped working (other application shortcuts set in the Keyboard Preferences Pane still work). Anyone else had this problem? Yes, same issue for me. Can’t seem to find a solution. I am still able to assign keyboard shortcuts to other menu items in Finder, such as “Rename”. The “three dots” (three individual periods) may have been replaced with a true ellipsis (type option-:). When I’ve created other keyboard shortcuts, I’ve found that some are the single ellipsis character, some are three separate periods. Other people above running non-English versions of Mac OS have mentioned the space between “Tags” and “…” needs to be non-breaking space (type option-space). Maybe some combination of both of these will help. This was one of the most valuable suggestions for getting the most out of Mac OS X, and it is definitely broken in Mojave. Go to finder prefences>tags and delete any custom tags, the shortcut should work again. That’s just not a helpful suggestion. Even if it worked, I’m not deleting years worth of effort tagging my personal and professional files. Definitely don’t delete your custom tags. I have no custom tags, but this suggestion doesn’t work anyway. It would greatly help if Apple adhered to a standard, or at least gave notice of cancelling an option. This definitely doesn’t work in Mojave. I have also tried all the options suggested here. If anyone finds a fix for Mojave, please post it here! Thanks! I finally got it to work again under Mojave by removing the favourite tags from Finder preference (as above – just drag them out of the box) and adding the shortcut as menu item “Tags…” – that is no space and ellipsis, not fill stops. Can confirm that this works in Mojave, at least so far! For clarity, you do not need to remove your TAGS from the Finder. You just need to drag them out of the Favourites section of the Tags tab in Finder Preferences. Once you’ve done that, you can enable a keyboard shortcut again per the notes above.